Teaser Tuesdays is a meme hosted by MizB @ A Daily Rhythm, where I need to open a book to a random page and pick two spoiler-free sentences. I just recently got this book from the library. I have always wanted to read a book by Brandon Mull! The prince dangled in the darkness, shoulders aching, ancient manacles digging into his wrists as he tried to sleep. The chains prevented him from lying down. Whether it was truly light or dark he could not say, for his enemies had stolen his sight. In the distance he heard screaming—the unrestrained wails of a man trying and failing to escape the deepest agony. The unnerving cries echoed from higher corridors, dampened by intervening barriers. After untold weeks in the dungeons of Felrook the prince could guess what the man might be feeling. Never had the prince imagined anguish so diverse and exquisite as he had experienced here. He stood up straight, taking some of the pressure off of his wrists. If they kept him chained here much longer, he felt certain his arms would detach. Then again he preferred his current accommodations to the previous room, where the floor bristled with sharp, rusty spikes, and lying or sitting required bloodshed. “Hello!” he called out, knowing it was pointless. “I want to go home! Hello! Hello?” He blinked back his tears, trying to get his emotions under control. None of this made any sense, but he had to calm down; he had to figure this out if he ever wanted to see his friends again, his parents, his family. Yikes! He's in a bad, bad situation. I want to know how he got there. Hmmm....I'd have to think about this one. Doesn't sound like my usual type of book. More like my husband's reading. 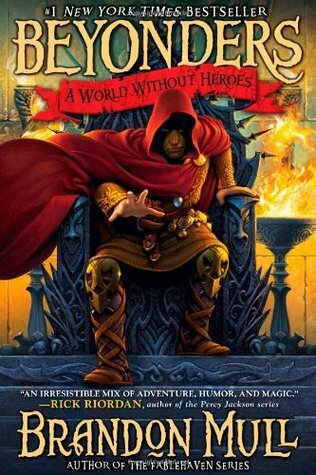 Though there is a blurb on the front my Rick Riordan. I'd consider it. Not my usual fare, but sometimes it's good to break out a little. Enjoy! He's in a very bad way, isn't he? I would keep reading. I love books like this, but haven't read one in a long while. I should remedy that. This book sounds too scary for me! However, I did appreciate the descriptive writing in the prologue. Sounds just like my cup of tea. I love High Fantasy. This sounds a bit too violent for me - at least based on that first paragraph. Hopefully, things improve for the prince?